The earliest record album to feature a mushroom cloud on the cover was not a rock album as you might suppose, but this Count Basie recording. The CD reissue has a more tasteful cover. The most famous such rock record jacket art is from the Jefferson Airplane’s Crown of Creation, whose photo credits claim that this is a picture of the Hiroshima bomb (though it seems actually to be from a September 14, 1957 Nevada test). The title song was inspired by a passage in a well-known postholocaust science fiction novel, The Chrysalids by John Wyndham, in which the new, mutant generation is praised as superior to normal humans. A nuclear cloud featured less prominently a year earlier on Grateful Dead. Here the theme is strikingly used on the cover of an album featuring anti-nuclear songs, Red Sails in the Sunset, by Midnight Oil. 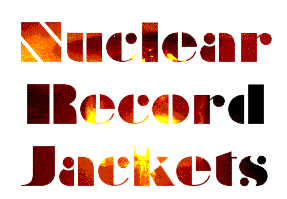 In the mid-eighties, nuclear war imagery became common in rock music videos. One student doing research for me reported that MTV was showing an average of one nuclear bomb image per hour. 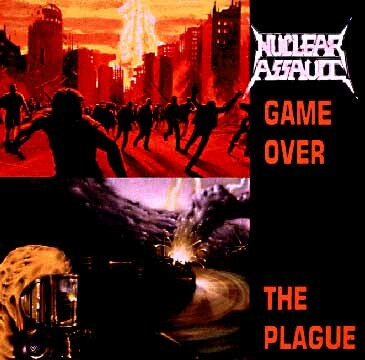 This album by the “speed metal” group Nuclear Assault featured several songs dealing with nuclear war.